Today I am featuring the home of Kristin Peters otherwise known as The Loungeista. 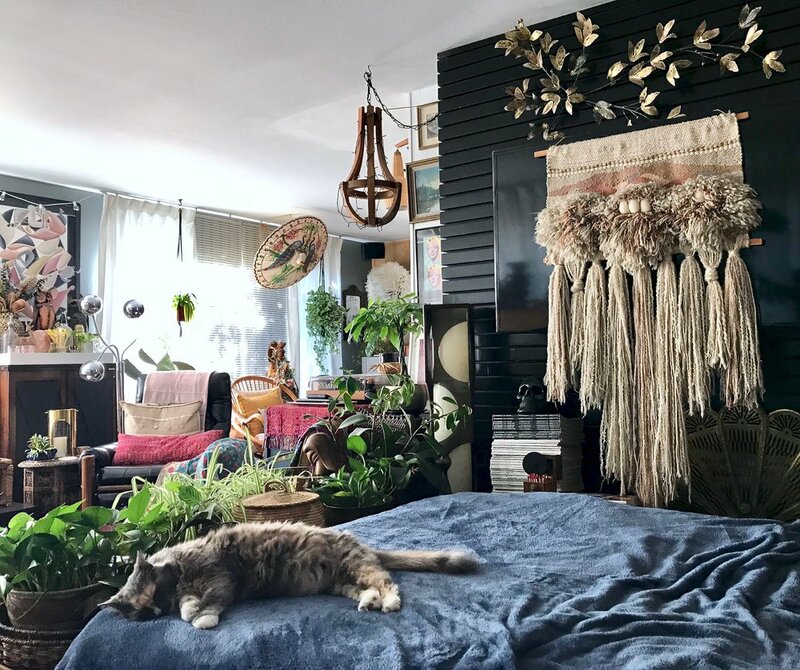 A boho, maximalist, home filled with vintage treasures, the house has been completely remodelled over the last 12 years, creating sumptuous home in which to relax, layered with textiles and plants. I grew up Southern California, and moved to the San Francisco Bay area 25 years ago. I run my own business as a healer during the day, but interior design has always been my creative outlet. So much so that I also stage homes on the side. When I met my future husband we fell in love quickly, and three months later we were looking to buy a house together! This house was so ugly from the outside we almost drove away, but when we walked into the living room and saw its giant windows framing the gorgeous San Francisco Bay I fell in love. He did not. So we left. But the house kept coming up again and again and when the price was reduced we agreed to take another look. The previous owner had built the house and his wife lived in it the rest of her life, so it was like walking into a time capsule from 1963! Structurally, it was in good condition, but it needed a face lift. It’s a modest ranch home with a great open floor plan. I had a vision of how I could make it a lovely home for us. I love a challenge, so we dove in! Every inch of the house has been remodeled by us over the last twelve years, and we lived in it during the entire renovation! (#marriagetherapy) My husband had a little construction experience, but mostly we learned as we went, searching for DIY techniques in books, online, and asking for help from friends in the trade. Painstakingly, we transformed our home from top to bottom. My home is always evolving, and continues to change as I try out new design ideas. My style is definitely over-the-top layered bohemian maximalism and my philosophy is anything goes! Breaking all the rules is what I do best. In the last year, I’ve really gotten in touch with my feminine side, embracing a love for pink, which used to be my least favorite color! Color makes me happy and I’m not afraid to use it everywhere in my home. I am a fan of dark floors and walls, but I haven’t gone completely over to the dark side yet. I like the drama and contrast and light and dark colors juxtaposed together. 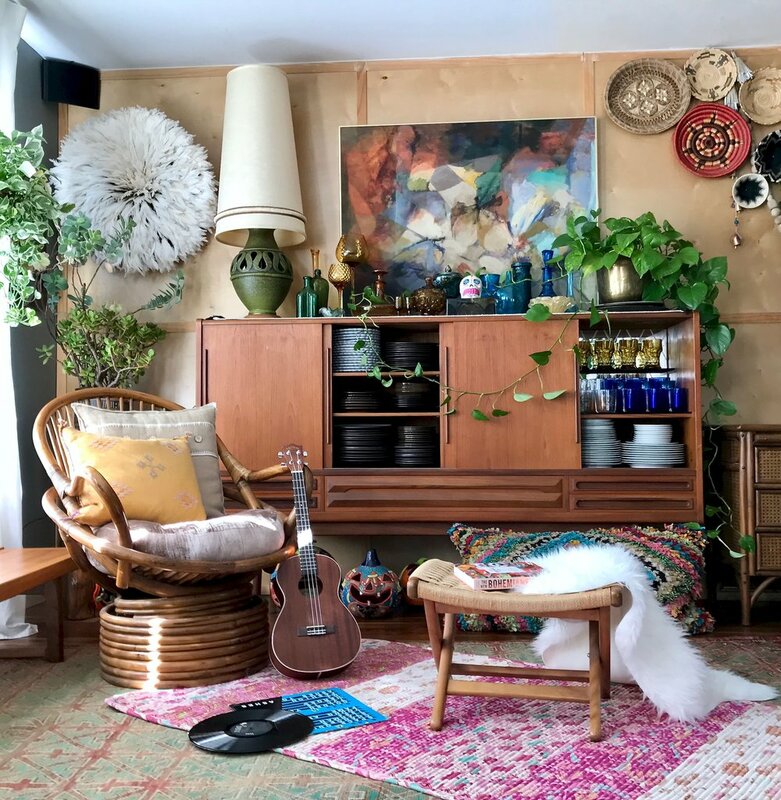 The spaces I create feel happy, fun and funky with a cozy boho vibe. For many years I’ve made a hobby of shopping for vintage pieces that have soul - anything handmade, or globally inspired. I’ve developed an eye for special pieces that speak to me. There’s a soft spot in my heart for rugs, poufs, and pillows. I adore textiles so much I’ve amassed quite a collection! In one day, I can quickly change my space just by changing out the textiles. Flea markets and charity shops have been a great inexpensive source of furniture and decor over the years. I love to mix high and low, it keeps things looking collected and authentic. Selecting the right pieces has gotten easier now that I buy with my gut, usually deciding in a few seconds if it’s right for me. When I see something and go ooooh (yes, out loud!) I know I’ll find a way to make it work. I’ve painted this entryway three different colors, never happy with the outcome until I found Black Sand by Clarke and Kensington. It’s a very blue-black and it makes a dramatic statement when you walk in! The dresser was found at a charity shop for a song, the mid-century asymmetrical wall mirror is from West Elm. After many years of struggling this room came together in a few days! Now I’m thinking of painting the hallway black too! Recently, I rearranged my home yet AGAIN, and now we have a bed right next to the living room fireplace! It was such a great idea, I wish I would have done it sooner. 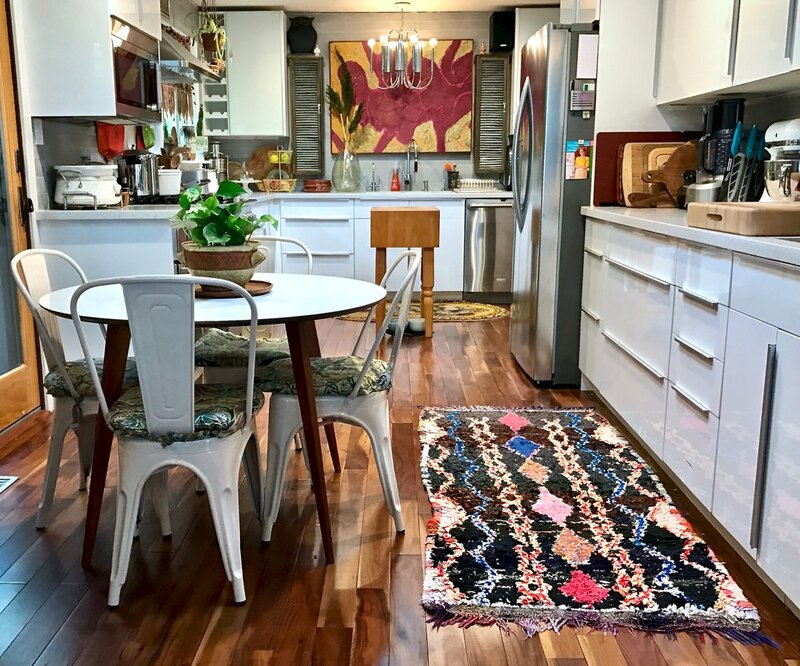 I threw this gorgeous Moroccan rug over the top, and now it looks chic day or night. The former coffee table ended up at the foot of the bed, and covered with plants. It feels like I’m outside sleeping next to the fire. My beautiful white dining room table was picked up from a home consignment shop. Since I moved it across from the bed in the living room it stores my interior design magazine and growing art collection, perfect for nighttime decor inspiration! The Juju hat was picked up at the flea market, the painting of the girl was found at one of my secret second hand stores, and the abstract painting was picked up on Instagram. The fiddle leaf fig tree has somehow survived our 14 years here! The sectional was purchased from a sale at a designer showroom, a total splurge, but worth it! It’s neutral, and easy to layer rugs and pillows in a rotating display of my favorite textiles of the moment. That’s a mid-century headboard behind the sofa, used to store linens for the bed nearby! The black reclining chair was found on Craigslist, and is the most comfortable chair in the house! The minute I sit here one of my two cats jump up on my lap. Next to it is a barware cabinet which houses my extensive collection of glasses. As you turn the corner of the L-shaped living room, you enter the lounge. The former dining room, which was a waste of space for the two of us, has been turned into our little bohemian paradise! 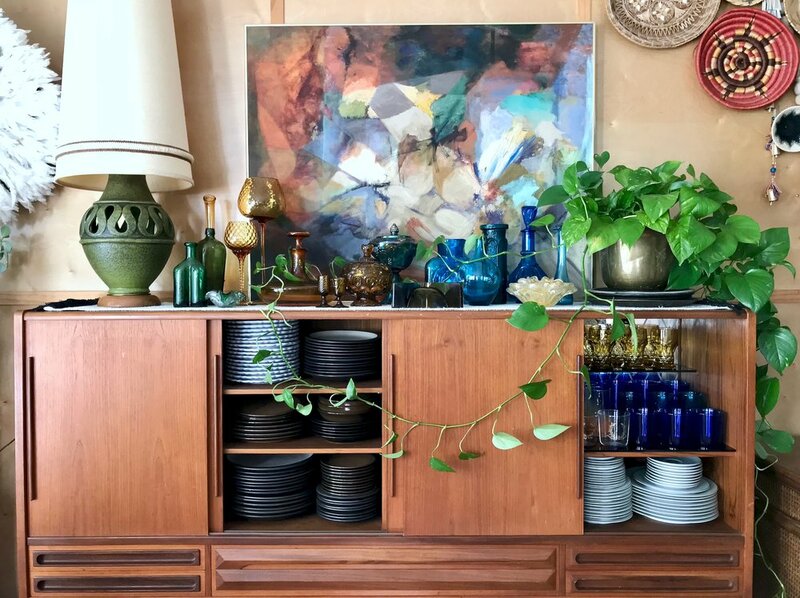 The rattan swivel chairs were found at an estate sale, and the mid-century credenza stopped us in our tracks as we drove by a sidewalk sale. The painting was found at a moving sale. It’s a great space to listen to records or have a morning stretch. Attached to the lounge is our white high gloss kitchen. It was dated, dysfunctional, and about a quarter of the size when we moved in. After many years of living with a partially ripped out kitchen (with counters on wheels!) we renovated it with IKEA cabinets for a light, bright, open space. The tile is from Habitat for Humanity and was such a great deal, we bought it all and covered the walls with it! There’s plenty of room for us to cook together, with two sinks and two ovens! It’s truly my dream kitchen, and I’m so happy with the way it turned out! Our house has a very laid-back vibe. The moment I walk through the door I feel like it’s giving me a warm embrace. It invites me to leave my worries at the door, kick off my shoes, and put on my comfy lounging clothes. I love to turn on some music and stretch out on the sofa with a cup of coffee and snuggle up with my fuzzy pillows and blankets. There are layers and layers of thick cushiony rugs draped on the furniture and floors. Piles of plush pillows beckon me to snuggle up against them. Plants cover every surface, creating the feeling of an enchanted forest. At night I turn on my pink cafe lights, giving the room a soft, luminous glow. Every surface is gleaming with beautiful colors and shimmering metallics. It’s a sumptuous feast for the eyes. I feel like I am luxuriating in a beautiful lounge, and I am The Loungeista! I’ve designed my abode for relaxation and a total escape from the world. It’s the perfect place to daydream and snuggle up with our cats Gracie and Zoey. Everyone says it feels cozy and magical. It’s great for hanging out with friends, or a simple candle lit dinner for just the two of us. We like to have a lounge party on Saturday nights, where we spin our favorite records and dance the night away! The next day we like to sleep in and make a mouthwatering brunch. Yes, life is pretty good here at The Lounge and we feel lucky to have such a beautiful retreat. I love that Kristin has decorated her house with no rules. I wrote a blog post on how to create a maximalist home here where I talk about just that. A home you create and collect for in the style that you want.